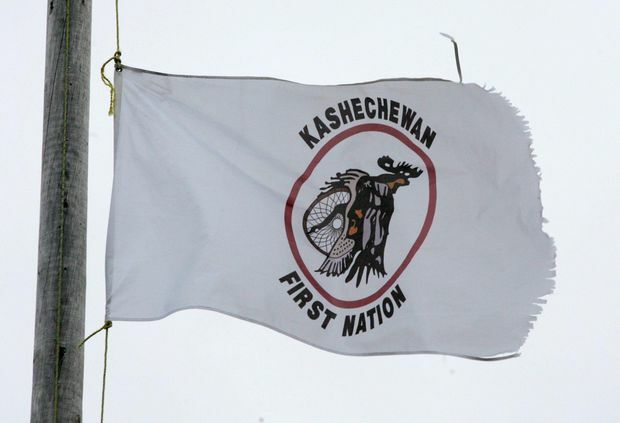 A tattered Kashechewan First Nation flag flies outside St. Paul's Anglician church on the Kashechewan native reserve in Northern Ontario on Oct. 30, 2005. The pain of spring flooding at a First Nation in northern Ontario is hitting harder this year, as government promises for a permanent new location remain far from reality. Starting on Monday, more than 2,500 members of the Kashechewan First Nation were to be flown out from the reserve located north of Fort Albany, Ont., and sent to other locations across the province. NDP MP Charlie Angus says Kashechewan has long dealt with spring flood and evacuations, but community members are finding this year harder because they believed the federal government was finally moving ahead on plans to relocate the reserve to higher ground. “This year, there is a lot of bitterness among people because it is just another broken promise, just another year of flooding and just another year of mass evacuations,” Mr. Angus said. “The plan was, ‘Let’s divert that money and start to actually build, piece by piece, a new community,' ” Mr. Angus said. The federal budget had no money to move ahead with this plan, Mr. Angus said. He is hesitant to say when the relocation will happen, but said work is under way with the community and the Ontario government. Kashechewan Chief Leo Friday has personally asked Mr. O’Regan to visit the First Nation so the minister can listen to community members about their hopes of relocating to higher, safer ground. “I don’t think now is the best time for me to visit,” Mr. O’Regan said, noting he will take the lead from the community on when it might be appropriate to come to the community. In the House of Commons last week, Ms. Philpott said she has remained in touch with the community, adding it “desperately” wants to be moved and has “huge” support to do so. In a letter to Mr. O’Regan, Chief Friday said the first recorded flood happened in 1976, adding Kashechewan has been evacuated every year since 2012 and that 36 homes needed to be demolished in the community in 2014 because of reoccurring flooding.